An Oregon company that sprayed pesticides with a suspended license now faces 180 thousand dollars in fines and a five-year license suspension. It’s the largest penalty for an aerial pesticide sprayer in Oregon. 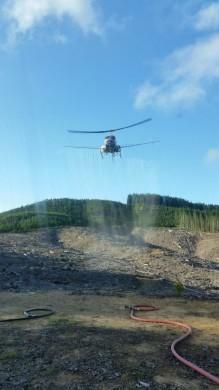 This photograph of a helicopter spraying herbicides is among hundreds whistleblower Darryl Ivy released after a month working for Applebee Aviation driving trucks and handling pesticides on Seneca Jones Timber Company sites. The penalties keep coming for Applebee Aviation. The helicopter company based in Banks, Oregon, was fined nearly 10 thousand dollars and had its license suspended in September. Multiple agencies investigated a worker complaint about chemical exposure. They found numerous violations. Now, the Oregon Department of Agriculture has found the company applied pesticides 16 different times while its license was suspended. Those included jobs on federal land and for the Oregon Department of Forestry. That’s the agency that regulates state forest practices. It’s also a partner agency in spraying investigations, like the one that resulted in Applebee’s license suspension. Applebee did not respond to requests for comment. The company has the right to appeal the enforcement actions. Lead and arsenic used decades ago in pesticides are still lingering in the topsoil of Pacific Northwest apple country. That poses a health risk for children who come in close contact with dirt -- in the backyards and playgrounds developed from former orchards. For decades, apple growers in Central Washington sprayed their trees with a misty brew of lead and arsenic to keep pests away. The practice stopped in the mid-20th century. Since then, many of those orchards have been redeveloped -- some as housing subdivisions, schools, and daycare centers. Even though the orchards are long gone, those toxic chemicals remain in the soil. Repeated high-profile incidents of people being sickened by pesticides sprayed from aircraft in Oregon have increased calls for new regulations. But push-back from agricultural and timber industry groups has led to a bill that supporters of stronger rules say won’t solve the problem.